If you need expert Magnolia heating repair, installation and replacement services, call 281-704-3696 today. Expect fast, affordable heating solutions you can trust. Are you interested in saving money on our services? Click here for online coupons and specials. Keeping your heating system working at full capacity when it’s cold outside is a responsibility every homeowner should take seriously. The best way to ensure you always have even heat distribution is to align yourself with a local, high quality heating expert in Magnolia, TX. When you already know whom to call, you can get a quick response and have any situation remedied before it gets out of control. If you want to know what others in your area think of our heating and cooling services, click here for online reviews. Heat pumps are remarkable pieces of machinery. They have the ability to transfer heat from the ground or the air and into your home to keep your family comfortable. Heat is the name of the game, but they actually use coils and refrigerant to make the heat movement happen. There are two coils and a refrigerant pumped between them. One coil absorbs the heat and the next one releases it. Heat pumps are effective for both heating and cooling. Is your furnace failing to work as efficiently as before? Make sure it is not running with a clogged filter. At Affordable American Air Conditioning & Heating we can provide professional furnace maintenance solutions, including filter replacement. We recommend changing the filter every three months for maximum equipment efficiency. Furnace installation is not a DIY job. When you hire a licensed installer to put in your new furnace, you can feel confident that it’s going to work efficiently and that it will provide you with comforting heat for years into the future. With a professional, you won’t have to worry about the manufacturer voiding your warranty, and you’ll know that your local building codes were followed throughout the process. All heating systems show signs of wear and tear and need repairs at some point. 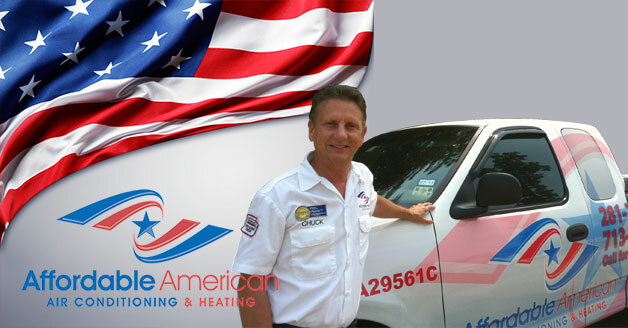 Call Affordable American Air Conditioning & Heating at 281-704-3696 for immediate service in Magnolia, TX if your furnace isn’t working the way it should. We will set up an appointment to have it inspected and fixed so you won’t have to suffer without heat.